127 pages. Published by Amberley Publishing in 2014. ISBN 978-1-4456-4058-7. Cost £14.99. Otainable from Amberley Publishing www.amberley-books.com and the Shuttleworth Collection shop, Old Warden Park, SG18 9EA. 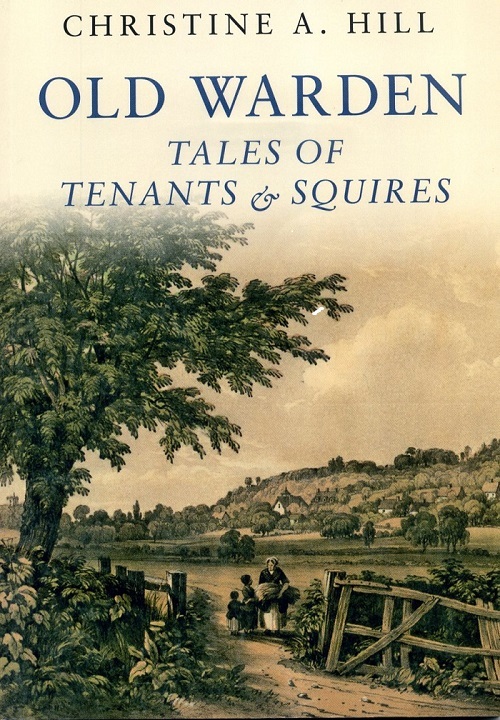 A highly readable, well-illustrated and informative account of the history of the estate village of Old Warden, its inhabitants and their relationship with the ‘Squires’ – the landowning Ongley and Shuttleworth families from the 18th to 20th centuries. Written by Christine Hill, a village resident, the book had its origin in a village social history project. Christine’s painstaking research shines through in her writing, as does her passion for Old Warden. The first chapter tells the story of the Ongleys, the village ‘Squires’ from the 1690s to 1872. Sir Samuel Ongley, a rich self-made man (a London merchant; director of the East India Company; first deputy governor of the South Seas Company; knighted in 1713) bought land in the parish from the mid-1690s, building up a country estate. He had Queen Anne’s Summer House built, which fine folly still survives. He was succeded by Samuel Ongley, M.P. for Bedford, and from 1726, Robert Henry Ongley, the first Baron Ongley, M.P. for Bedfordshire. Robert Henry Ongley, the second Baron, inherited the estate in 1785, developing the estate and becoming a well-known local ‘agricultural improver, as well as laying out the park around Old Warden House. The third Baron Ongley remodelled the village in the ‘rustic’ style, restored the church and commissioned a landscaped “Swiss Garden”. He left the village in 1854, in financial difficulties, leasing out the House. The estate was sold in 1872, shortly after his death. Chaper two tells the story of five generations of Shuttleworth Squires: Joseph, who purchased the estate in 1872, demolished the Ongley house and commissioned Henry Clutton to design a striking new house, stable block and lodges. Frank, who inherited in 1883, an enthusiastic sportsman and member of the Yeomanry. Dorothy Shuttleworth, his wife, became trustee of the estate on his death in 1913, supporting the war effort (she offered Old Warden Park to the Red Cross as a convalescent hospital) and tutoring her son, Richard, in his responsibilities. Richard inherited in 1932. A keen flyer, he built a grass airfield, and indulged his passions for veteran cars, aeroplanes and motorcyle racing, steeplechasing and hunting, as well as managing the estate. He was killed whilst serving in the R.A.F. on night flying practice in 1940. Dorothy took over the estate and founded the museum housing her son’s collection of vintage bikes, cars and aeroplanes. Subsequent chapters provide rich insights into the lives of tenants, servants, children and their education, charity and welfare,the gardens – both the Park and in the village, crime, religion, war and defence, visitors, and ‘fun, games and entertainment’. An excellent book, well worth reading if – like me – you’re fond of Old Warden and want to find out more about the village’s development, or you have friends or family from there, as well as for the serious student of rural social history interested in the story of a classic ‘estate village’. Strongly recommended.